Competitions are open only to D&WAA registered members each of whom is an Insured for the purposes of the Angling Trust's Combined Liability Insurance policy whilst acting in connection with the D&WAA's activities and conforming to its rules and by-laws. All competitions (save for the Christmas competition on 20th December 2015 and the "flatfish-only" (sole) competition on 29th August 2015) start at 5pm and end at 9pm and all competitors must be present at each venue no less than 30 minutes before the scheduled start time i.e. at no later than 4:30 pm. The "flatfish-only" (sole) competition, to be held on Saturday, 29th August 2015 at Cambridge Road (gardens), starts at 8pm and ends at midnight and all competitors must be present at the venue no later than 7:30 pm. The Christmas competition, to be held on Sunday, 20th December at Horsa Road (groynes), starts at 3pm and ends at 7pm and all competitors must be present at the venue no later than 2:30 pm. Boundaries and pegs are set on the day of each competition. No more than one (1) rod and three (3) hooks to be in use at any one time. Five prizes are awarded from the total of the entry fees collected at each competition: first (40%), second (25%) and third (15%) place and heaviest round (10%) and flat fish (10%). A prize is shared if and when an eligible catch is matched. The prize for the heaviest round or flat fish, if none eligible is weighed in, is awarded to the second heaviest of the other class weighed in. The Gillett Points System has been adopted by the D&WAA for all club competitions in 2015. The D&WAA is an affiliate of the Angling Trust, whose recommended retention sizes for shore-caught fish apply to all D&WAA competitions. Following these recommendations will ensure that neither the D&WAA nor its members are in contravention of any local bye laws set by the Kent & Essex Inshore Fishery and Conservation Authority. The Secretary's decision on all matters, including competition disputes, is final and conclusive. 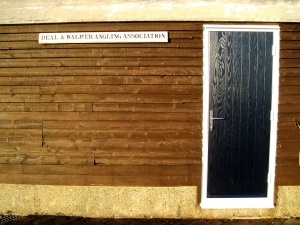 The Deal and Walmer Angling Association invites new members to join the club. 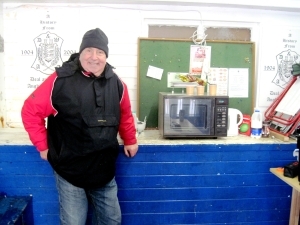 Founded in 1904, it is one of the oldest established sea angling clubs in Britain. 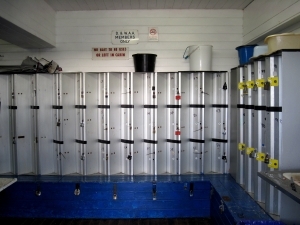 The members have full use of the only cabin that is open on Deal Pier. The cabin provides club members with shelter and the use of its facilities - lockers, hot and cold running water, kettle, microwave etc. As the club is affiliated to the Angling Trust it allows members to participate with third party insurance whilst fishing in the club competitions. Details and membership renewal forms are available from Pleasure Angling (Dean) and Channel Angling (Fred), Deal's two bait and tackle shops. Under the Gillett points system, match points are allocated to catches in descending weight order starting with 50 points for the heaviest catch e.g. 50 (1st), 49 (2nd), 48 (3rd), 47 (4th) and so on to the lowest weighed-in catch e.g. 41 (10th) at which point the remaining points (40) are halved and allocated to each of the match participants not weighing-in e.g. 40 ÷ 2 = 20 points for each of the anglers not weighing-in. The purpose of the Gillett points system is to mitigate the unduly harsh effects of "blanking" and encourage club members to continue their participation in club matches throughout the 2015 campaign. The Gillett points system also obviates the need to allocate additional points for weighing-in and attendance. All undersized flatfish are to be measured, recorded, signed-off and returned until three (3) sizeable flatfish have been caught, following which undersized fish will not be recorded. Please note that it is the individual angler's responsibility to ensure that, after being measured and recorded, all undersized flatfish are returned alive to the water from which they were taken and must not be retained. The length of all flatfish is to be measured in centimetres, from the tip of the snout to the end of the tail fin and, should there be any dispute on the measurement of a flatfish, the D&WAA Secretary's Master Measure will be the deciding measure. The three (3) heaviest sole take priority over all other flatfish caught but, if three (3) or less sole are not caught, then sizeable flatfish will take the prizes. If no sizeable flatfish are caught the longest total of undersize sole will take precedence over any other flatfish. For the purposes of the D&WAA "heaviest flatfish" of 2015 award, the longest sole (or flatfish if no sole is caught) measured at this competition will also be weighed. Five prizes are awarded from the total of the entry fees collected at the competition: first (40%), second (25%) and third (15%) place and heaviest flatfish (12%) and second heaviest flatfish (8%). A prize is shared if and when an eligible catch is matched. If less than three (3) flatfish are caught the prize(s) is\are awarded on the basis of the outcome of a draw of the competitors' peg cards. In addition, points will be awarded in the usual way. The competition will be pegged on the stretch of Walmer beach from Cambridge Road heading north to the pier and fished between 8pm and midnight on Saturday, 29th August 2015, so please try to be at the Cambridge Road venue by 7pm. The "measure-in" will take place 15 minutes after midnight.